VIMSIA's College Counseling Department hosted our annual Alumni Lunch today! Eleven alumni including: Christina Brett '17, CJ Fahie '16, Niquay Leonard '17, Kobe Potter '18, Silas Wisehart '18, Nalani Figueroa '18, Vanshika Lulla '18, Ali Bartsch '17, Leah Trotman '17, T'Leah Serieux '17, and Vernelle Callwood '18 returned to campus to speak to our Diploma Program students. They shared advice and insight about life after high school and their adventures in college. Students engaged in discussion about the college experience and how the IB Program prepared them for academic success. Many thanks to our alumni for the support of our students! With new times, come new traditions. 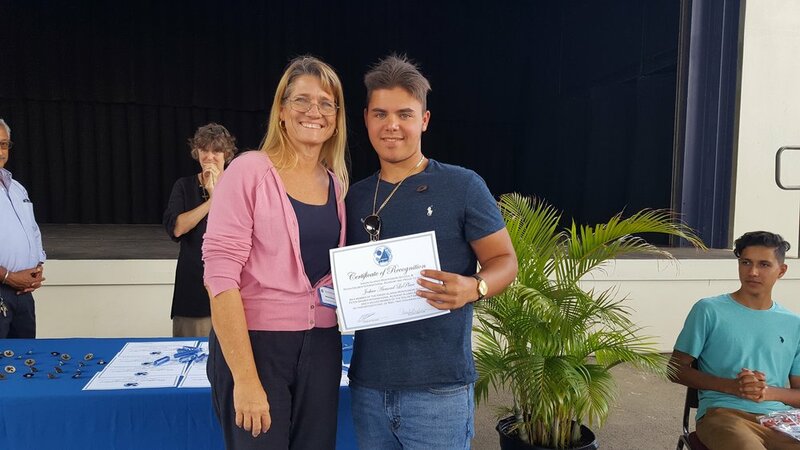 On Wednesday, May 16 Virgin Islands Montessori School & Peter Gruber International Academy (VIMSIA) seniors were welcomed into the Alumni Association through an induction ceremony. Each senior was welcomed into the association by a current alumni of VIMSIA. This ceremony was created to formally represent the transition from the status of undergraduate member to alumni status within VIMSIA. It was a surprise to all when our guest alumni were also inducted into our newly established Alumni Association. All members received an alumni pin, certificate of recognition and a VOLT bracelet. A special thanks goes out to our guest alumni: Tess Monsanto, Vernon Araujo, Alayna Belshe, Melissa Bump, Shane Brunt, Ched Sharpless and Tommy Brunt. Congratulations to all! PGIA alumna and former MLK, Jr. Award recipient, Leah Trotman, is continuing to make a difference in her collegiate life. She is currently a freshman at Agnes Scott College in Atlanta, GA where she was the only freshman to serve on the President's Committee for Puerto Rico and USVI Hurricane Relief. It was Leah that contacted the President and Dean of Campus Life after these events to see how Agnes Scott could mobilize their efforts to help. She also is a member of several campus clubs and organizations and already holds leadership roles as a freshman. Recently, she was accepted and given a full scholarship to attend the 2018 Institute on Philanthropy and Voluntary Service as a participant in the Leadership Scholars Program. The PGIA College Counseling office hosted the fourth annual Alumni Luncheon on Wednesday, December 20th. Our alumni were full of energy and excitement as they returned to campus to share experiences, insights and goals with our current juniors and seniors. Many of our returning alums have only completed their first semesters of college but are well of their way to blazing some amazing trails. "Be an advocate for yourself and what you believe in." "All of your hard work (in the DP program) is totally worth it." Thank you Alumni! We wish you the best! We love, love, love when our students come back to visit. Today we had a visit from PGIA Class of 2017 graduates: Ali, Aneesh and Leah. What a treat! They have all just finished their first semester at college. Ali is in engineering at Stanford, Aneesh is focusing on sciences, with a specific interest in biology at Clark University and Leah is deciding whether to major in International Studies or Public Health (possibly both) at Agnes Scott College. I tried to interview them with a few simple questions - What do you like best about college life - Were there any huge surprises - Did you feel prepared - but honestly they were going a mile a minute with each other and me about their experiences and how amazing things are. I was totally blown away by them and couldn't stop smiling. So, I'm definitely giving the cliff notes version of their conversations and am sure I will not be able to convey their enthusiasm - so please assume all of the following is written in caps with tons of emojis and exclamation points. "What do you like best?" All three hit on the same theme. The people they are engaging with. Whether their peers, professors or guest lecturers they all say they are meeting very interesting, diverse and accomplished people. Ali met the woman that discovered carbon dioxide contributes to global warming and has a chance to interact with the COO of SpaceX "soon come". She spoke of these ladies with such reverence and awe - I am just waiting for the day that some young woman feels the same way about her chance to meet the prominent Alison Bartsch. Leah is involved with Campus government and continues her strong interest in service with a plethora of activities - I must admit I lost count. In the wee hours of the Hurricane Irma's pounding of our island, this bold freshman wrote to the president of her college (and quite possibly the Danish government) to initiate a movement for relief efforts. Aneesh (in a quieter very Aneesh-ish way) is also really excited about the people his is meeting - "They all have such great stories about how they came to be at this point in their lives". "Do you feel that you were well prepared?" This was easy. They all said "yes". And they recognize that many of their peers are not nearly so well-prepared. Writing and citations were a big topic. Leah and Aneesh felt like the class experts and were a little bored with the basic reviews they had to sit through. Apparently everyone at Stanford falls in the "very well prepared" category. They all felt that the study habits they developed in high school are serving them well at this level. Leah was able to credit out of three Spanish semesters and an Anthro semester based on her PGIA IB Transcript. So nice to see them. I'm still beaming. Our students are "glowing" up (Aneesh's term - I like it). Ms. Shournagh McWeeney teaching a Primary class, circa 1970. Over 45 years later, her legacy as a key educator, leader, and friend of the VIMSIA family is stronger than ever. All School Group Photo, 2010. Taken at what is now our solar awning space, this shot includes VIMSIA's first high school graduate. Since then we have sent graduating classes of up to 17 students off to take on the world! Alex started in Montessori at the age of 2 and graduated from our IB program in our second graduating class - 2012. He went on to The Pennsylvania State University and has recently graduated with a Bachelors of Science in Nuclear Engineering. He is now working as a test engineer at The Savannah River Nuclear Site Salt Waste Processing Facility. Alex was among the first five students to have spent their whole student lives through high school at VIMSIA. Alex's fondest memories are chess team with Coach Allen and Soccer with Señor Araujo. When he started out in the High School, Ms. Zakers and Ms. Heersink taught every class! Congratulations, Alex, on your college graduation and best of luck in your new career! Thanks for stopping by to visit. On Wednesday, January 4, the PGIA College Counseling office hosted the third annual Alumni Luncheon. This is a time when all alumni are invited to return to campus to offer pearls of wisdom to our current juniors and seniors. It's also a time for them to reflect on their experiences here and provide our administrative team with constructive feedback. This year, 19 alumni returned. Each of them shared stories of their college experience and future plans. It's so exciting to see the paths they have chartered! Our former Volts are certainly making their marks on the world. Kai Bartlette '11 graduated Providence College with a BA in math and Spanish. She is currently getting her PhD in applied mathematics at the Colorado School of the Mines. Nathaniel Fuller '11 is getting his Bachelor's degree in Computer Science at the University of Maryland, Baltimore County. Kelsey Morrison '13 will graduate Ohio Wesleyan this May. She spent last semester in Chicago working with a law firm on human rights abuse cases. Her future plans are to pursue a JD/PhD program. Ariel Stolz '13 will graduate Brown University with a degree in Mechanical Engineering. She plans to take a gap year to travel and then obtain a graduate degree in sustainable energy. PJ Chemont '14 is getting a Business Technology and Marketing degree at the University of Miami. He is also a drumline section leader. Isis Collier '15 is a dual sport athlete (soccer and lacrosse) at Cornell College in Iowa where she is pursuing a degree in music and kinesthesiology. She still plays the violin. Michael Emanuel '15 is at University of Rochester studying Political Science with hopes to attend law school in the future. Tariq Davis '15 is at Beacon College in Florida studying Business. Noah Stolz '15 is at Rensselaer Polytechnic Institute studying computer science and cognitive science. He is currently conducting research at RPI in coordination with a professor at UVI. Jeremy Knight '15 is studying Environmental Science and Sustainability at Emory University. Whenever he's on island, he interns with the Department of Fish and Wildlife. Dakarai Potter '16 is studying Health Management Systems at Duquesne University in Pittsburgh. CJ Fahie '16 is studying Computer Engineering at Indiana Tech and playing soccer. Kiyalyn Bump '16 is enjoying her Creative Writing and English program at Dalhousie University in Canada. Nicholas Figueroa '16 will begin a Bachelor's in Business Management at Embry Riddle Aeronautical Institute this month. He spent this semester on island getting his pilot's license. Naomi Laing '16 is attending UVI studying Business with a concentration in finance. She plans to transfer to a school in Florida for her sophomore year. Shakima Esprit '16 is also studying at UVI focusing on nursing. Isabel Setorie '16 is pursuing Pan-African Studies, Spanish, and Linguistics at Drew University. Abe Hamed '16 is studying Business at Valencia College. Jesse Wyatt '16 is studying Art at St. John's University. Today we welcomed back graduates from our very first IB graduating class to last year's class. Huge thanks to Mrs. Elger for organizing an alumni luncheon today to bring our graduates back. 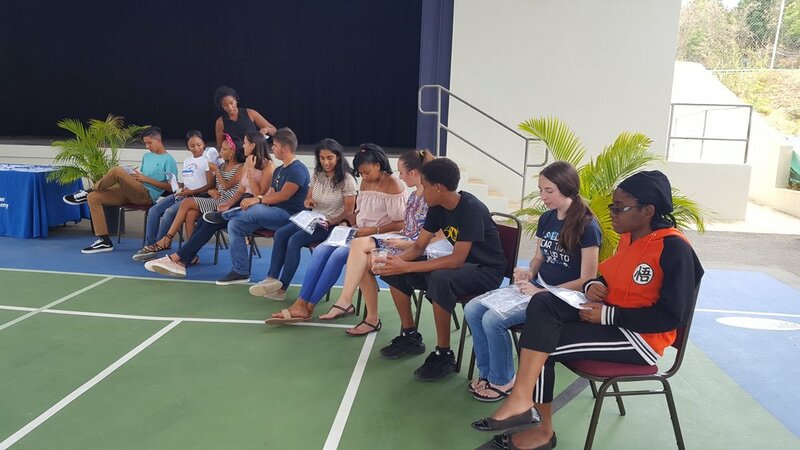 The PGIA Juniors and Seniors were invited for a round table discussion about life after PGIA. We are so proud of all of our students and so appreciative to these alumni for taking time to share their stories. GO GRADS!